Visitors walking through Rough and Ready Forest State Park on an abandoned road. The Rough and Ready Forest State Park is a unique botanical landscape that has inspired nicknames such as the Red Rock Rain Forest and Gobi Desert, each name describing the barren landscape in a place that gets about 60 inches of rain every year. 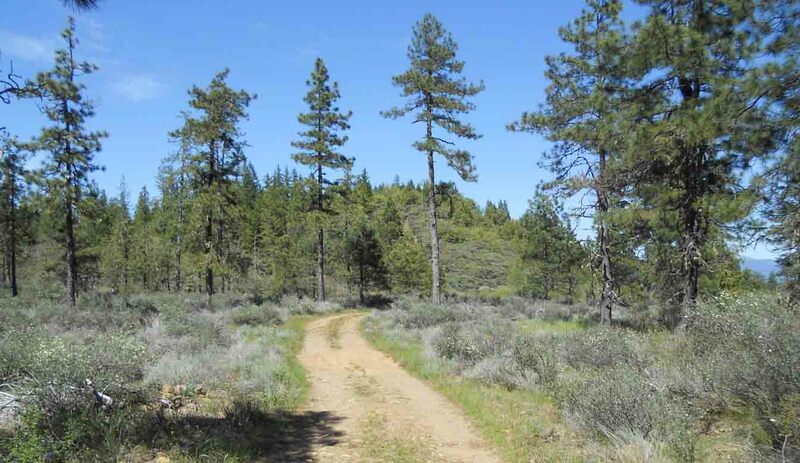 Here, amid forest lands of dense pine and fir forest, is a place with a plant community you would expect to find in the high desert of eastern Oregon. It takes about 20 minutes for the round trip hike to the end of the wheelchair accessible trail and return. 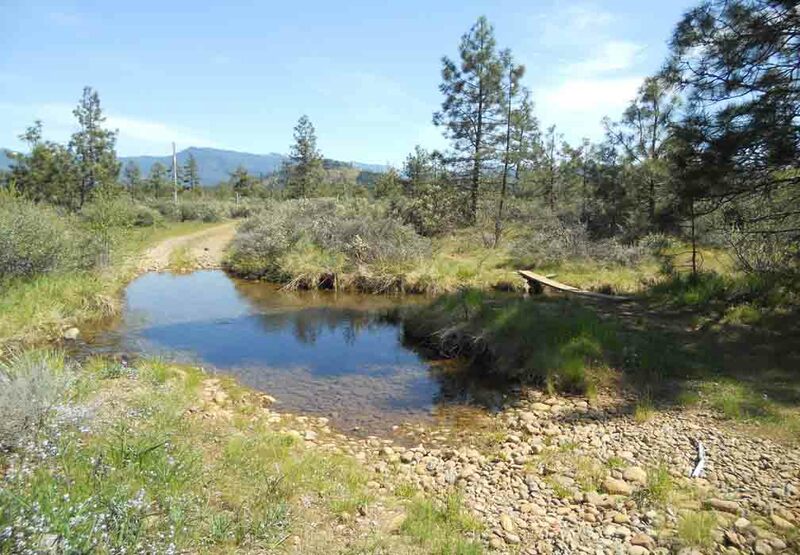 A longer hike can be taken through adjacent Bureau of Land Management (BLM) and Forest Service botanical areas to Seats Dam, a small diversion dam on Rough and Ready Creek. The hike from Highway 199 to the dam has a one way distance of about one and a half miles. Pilots – Rough & Ready Forest is a half a mile south of the airport tarmac. See the following link for more information on Illinois Valley Airport. From Cave Junction, follow Highway 199 south for about five miles. The turnoff into the parking area is on the right next to mile marker 34 just before the bridge where the road narrows to a two lane highway. Driving from O’Brien (from the south), the parking area for Rough and Ready Forest State Park will be on the left after crossing the Rough and Ready Creek Bridge. There is no turning lane so turn on your left turn signal and start slowing down while you are on the bridge to slow traffic behind you. Once you have crossed the bridge, the road becomes a four lane so faster moving traffic can pass you as you make your turn. 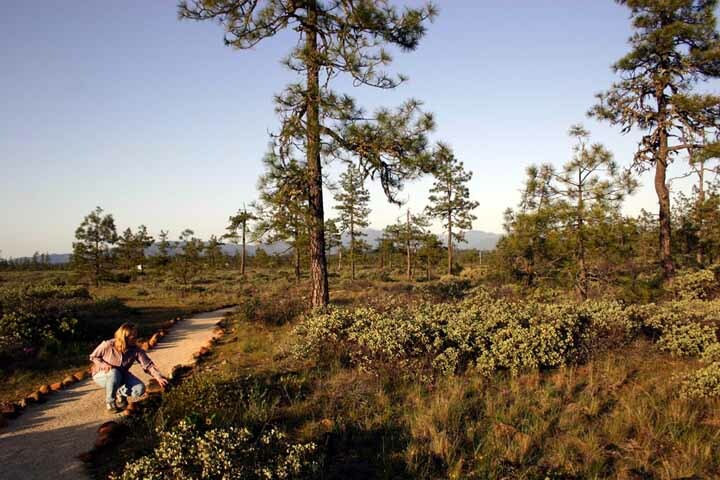 The terrain is relatively level and offers a wheelchair accessible trail that goes through this unusual landscape for about a half mile to a vista point with one picnic table. 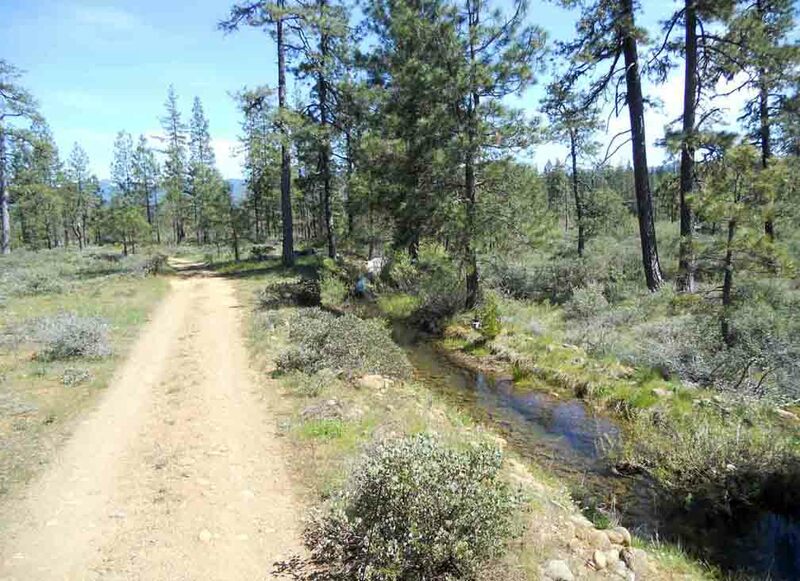 People who want to take a longer walk can follow the abandoned road for another mile to Seats Dam, a small dam installed decades ago to divert water for the lumber mill water ditch. The round trip distance from Highway 199 to Seats Dam and back is about three miles of fairly level walking. The photos below show the road at various locations along the route with the last photo showing Seats Dam. The best time to see wildflowers at the Rough and Ready Botanical Area is in early May through early June. 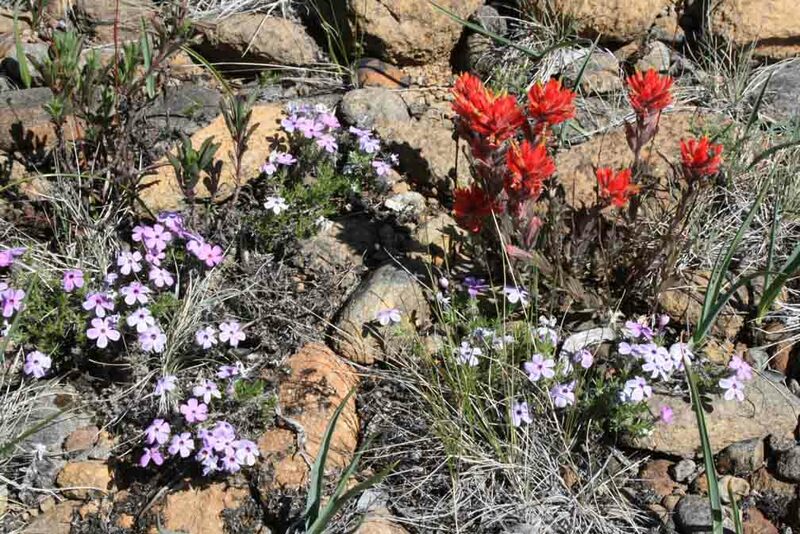 Wildflower programs and classes are offered in the spring by local community groups such as the Siskiyou Field Institute, Garden Club, and Native Plant Society. Rough and Ready Forest State Park was established in 1937 through the efforts of the local garden club. They became aware of the botanical significance of this unique landscape as a result of their own self education programs. They began their efforts to establish a park during the Great Depression when “you couldn’t rub two dimes together” in this community. Jobs were as scarce as money and the need for protecting the site became more urgent as entrepreneurs looking for ways to make money began digging up rare plants to be sold as botanical novelties. They raised their own money and sent delegates to the Oregon capitol to push for the creation of a state park. In 1937, their dream was realized with the establishment of the 90 acre Rough and Ready Forest State Park. Read the story about the Illinois Valley Garden Club and their involvement in establishing this park. Rough & Ready Creek Canyon located about two miles up stream from Rough & Ready Forest State Park. Looking west into Rough and Ready Creek Canyon toward the Kalmiopsis Wilderness. 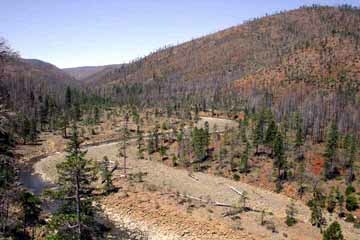 The entire watershed of this creek is contained within the largest outcrop of mantle rock in North America. 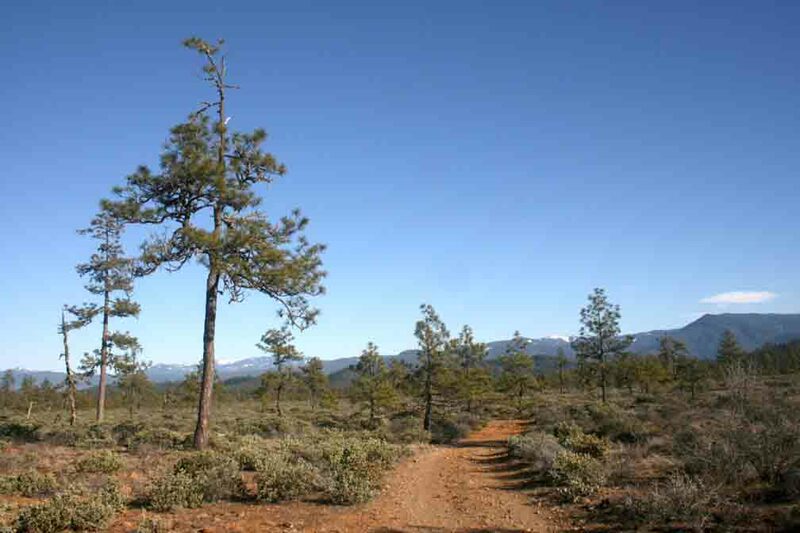 Rough and Ready Forest is situated on a geologic terrain that creates a combination of challenges for plant growth. It is composed of river cobbles and gravel, estimated to be 30-60 feet deep, which does not retain rain water. For this reason, the ground quickly drains creating an artificial arid environment in a place with an average rainfall of 60 inches. In addition to this, the Rough and Ready Creek watershed is entirely contained within one of the largest exposures of mantle rock in North America. These rocks are carried out of the canyon where they spread out in a fan-shaped deposit called an alluvial fan. This is possibly the largest alluvial fans in the United States that is composed almost entirely of mantle rock. Mantle rocks do not contain many essential plant nutrients and the soil from the break-down of these rocks tends to be poorly suited for supporting plant growth. Mantle rock also has large quantities of chrome and nickel, which may be toxic to some plants. The combination of arid conditions, poor soils and toxic metals result in a community of plants that are best suited for survival under these extreme conditions. 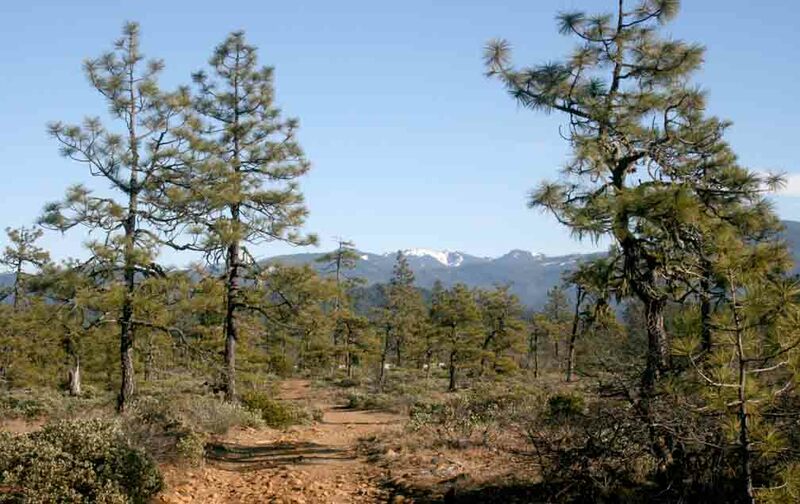 Many of the trees growing here tend to be dwarf versions of trees that would otherwise grow to 100-200 feet if soil and water were not constraining factors. This unique environment is what makes Rough and Ready Forest State Park an unusual and one-of-a-kind place to visit as you travel on the Redwood Highway of Oregon and California. The lighter colored deposits in the right hand image indicate younger deposits from the Holocene (about 2,000 years) and darker colors to indicate older deposits from the late Pleistocene (10,000 years). Samples of peridiotite taken from Rough and Ready Creek near Highway 199. The picture to the right shows mantle rocks from Rough and Ready Creek that exhibit various degrees of serpentinization. 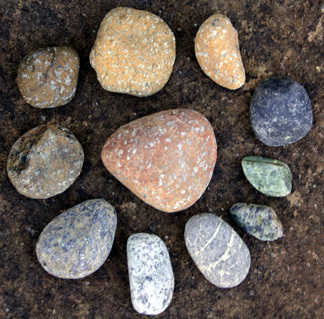 The rocks are arranged to compare different stages of serpentinization. The dark brown rocks along the left (and the rock in the background all these rocks are sitting on) has the least alteration. Black and green rocks along the lower right are the most heavily serpentinized.The orange and red rocks at the top and center show how iron in the rock can rust and stain these rocks. This rusting is what gives the exposures of mantle rock in the surrounding mountains a reddish tint. Mantle rock is called peridiotite and, in this region, there are three basic types of peridiotite; harzburgite, dunnite, pyroxinite. The most common type of peridiotite in the Rough and Ready Creek watershed is harzburgite (saxonite). Mantle rocks are altered to serpentine when water comes in contact with them under high temperatures and pressures. Peridiotite does not change to serpentine under surface temperatures and pressures. Rain falling on the rocks won’t cause them to change.